OK, so I wasn’t real quick on the uptake this week. I knew that I wanted to make fajitas this week, but hadn’t found a recipe before I went shopping – I thought that I was bound to have whatever the recipe called for. When I finally went looking for recipes, it turns out I had pretty much none of the ingredients. I still wanted fajitas so I decided to make up my own marinade. I measured nothing. Here’s what my marinade consisted of in varying quantities: ginger ale, extra virgin olive oil, soy sauce, all spice, cummin & green onion. I marinated the steak for about 5 hours, cooked it up & it was ready to go. I was actually really pleased with it. Yum! 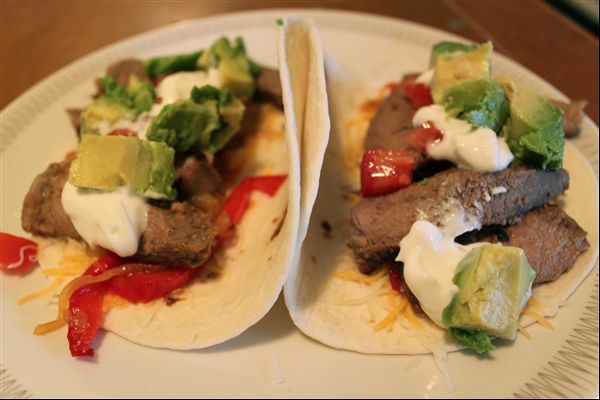 Categories: Cooking | Tags: cooking, fajitas, recipes | Permalink. very nice. But you should have put marmite and peanut butter in it.